Banking heiress Ursula Nunes has lived her life on the fringes of Philadelphia’s upper class. Her Jewish heritage means she’s never quite been welcomed by society’s elite…and her quick temper has never helped, either. A faux engagement to the scion of the mid-Atlantic’s most storied family might work to repair her rumpled reputation and gain her entrée to the life she thinks she wants…if she can ignore the way her “betrothed” makes her feel warm all over and stay focused on her goal. Former libertine John Thaddeus “Jay” Truitt is hardly the man to teach innocent women about propriety. Luckily, high society has little to do with being proper and everything to do with identifying your foe’s temptation—an art form Jay mastered long ago. A broken engagement will give him the perfect excuse to run off to Europe and a life of indulgence. 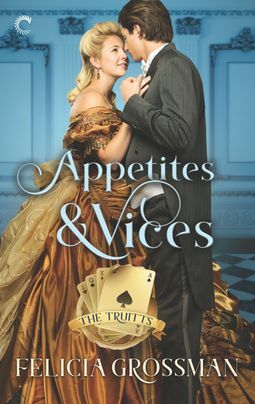 Publisher’s Note: Appetites & Vices deals with topics some readers may find difficult, including substance abuse and mental illness. Read up on the latest book news and enjoy exclusive interviews, recommendations, contests and more. Copyright ® 2017-2018 Harlequin Enterprises Limited. All Rights Reserved.